Jaime Rummerfield, of Woodson and Rummerfield in Los Angeles, has long been one of my favorite interior designers. As fiercely talented as she is fabulous, Jamie has designed spaces for a long list of celebrities including John Travolta and Kelly Preston, The House of Versace, and Christina Aguilera. She and her design partner, Ron Woodson have created a glamorous image spanning both interiors and personal style that evokes images of Hollywood’s golden era in the 1950s and 1960s. Woodson and Rummerfield’s design style is bold, inspired, and entirely unique. While their aesthetic is reminiscent of the Hollywood Regency look, it goes a step further. Jaime coined the term “Modage” to describe her firm’s style, which is a mix of modern and vintage. I love how grand their designs are! When something is as bold as the rooms designed by Woodson and Rummerfield, they feel special. 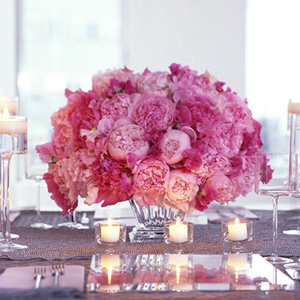 They are no longer spaces in which to dwell, but occasions to celebrate! Jaime and Ron penned a book, High Style that is a must for anyone who loves design and Hollywood glamour. It features gorgeous photographs of their work, along with tips for decorating and entertaining. I blogged about Jaime and Ron for the first time nearly two years ago and I must say that I am beyond thrilled to have Jaime as a guest here today. JR: In elementary school I saw the movie "Wall Street" Daryl Hannah was Michael Douglas' and Charlie Sheen's interior decorator and I thought it was such a chic way to make a living! Truly, I have always known this is what I would do as long as I can remember. JR: The most challenging is realizing that my design career is nothing like the movie Wall Street, really. This business is not for the faint of heart, there is a lot of rolling up your sleeves doing tasks that are not glamorous. Balancing client expectations, timelines, and hundreds of project deliverables keeps me on my toes. However, having the opportunity to do what I love everyday is magical. Seeing, touching & exploring different materials, styles, and looks for a project is very rewarding and inspiring. JR: Some say everything has already been done. I would agree. Except, I do believe that even if I tried to duplicate something that inspired me, that something new would emerge based on the science behind the combination of context of the space, client needs and approach. Understanding good design is seeing that ordering systems may be repeated, but the conceptual executions are like fingerprints, no two are ever the same. Hence, elements such as details, colors and textures of fashion melded with the ornamentation and nostalgia of vintage decorative arts and furnishings play a big roll in my design inspirations. JR: "Modage" (literally, I trademarked it). It essentially means modern vintage. JR: I give 150%, and expect the same in return. JR: Live in the moment and don't sweat the small stuff. JR: Surviving the recent recession! In all seriousness, publishing a design book with Chronicle Books and being inducted into the Library of Congress. Owning a successful design company, I believe, is a big achievement in many ways and being the designer to an A-list clientele is phenomenal. I am always learning from the people around me and inspiration comes in somewhat of a heightened level in Los Angeles ~ that motivates me to strive for more each day. JR: Live fabulously everyday; make no excuses for having your own flair and style! To see more of Woodson and Rummerfield’s fabulous work, visit their website. Jaime understands the importance of social media in today’s design industry and is quite active on Twitter. I love it when she posts pictures of her adventures around L.A. Get in on the fun and follow her tweets! Who doesn't love Jaime? She is the sweetest girl and now that I know that she LOVES Mexico I like her even more. Good work! An amazing post, with great pictures and insight into this great designer. Big fan of your blog Paloma! paloma, good interview. love her profile. jaime is my personal fave girl....she is super sweet + gorgeous! Thanks for the introductions...I've always felt/believed that the best design (be it interior or fashion) is best expressed when there is some type of juxtaposition....hence her "Modage" style...Love it. Jaime is really incredible. We even love the same book! Ohlala, thank you for the interview Paloma! Great interview - I have loved their designs for such a long time - they are so glamorous and beautiful. And I don't really feel like I see a whole lot of their stuff in blogland - thanks so much! I briefly met Jamie at an event the designer I work for had a few months ago at the W Hotel Residences. I wanted to say so many nice things to her, but was overcome by shyness. Jamie, if you're reading this, I love your work. And I too am a big Miike Snow fan. what an excellent post! that green and turquoise room is just exquisite. Amazingly talented!! Love that fireplace in the first pic!! I was so excited to see this profile of 1/2 of my fave design team! 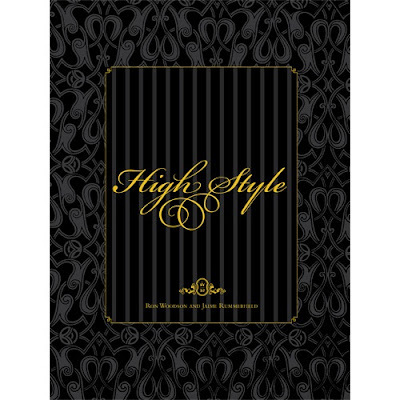 I love their book High Style and look through it a lot. Paloma, this is such a great series, and your readers so appreciate it! Eeek. I spelled previously spelled Jaime's name wrong. I hate when that happens. My apologies. Goodness, what is wrong with me?!? I'm just gonna quit writing for the day. Intriguing interview with a very intriging designer. I love designer that truly can follow their instincts and just create in an amazing way. Their work is totally unique. Glad you showcased them. wow that first picture is amazing. Love the B&W harth! her work is beyond! - i would give anything to have that stuff! - great post lovey!!! Great interview! Love the all black mantel in the first photo, really shows off the gold mirrors! So refreshing to see fearless, inspiring interiors that break expected design rules. You need to start a magazine!! Your blog is fantastic!! Lover her! She is amazing! This is a fabulous interview... love her work and collection. "Modage" - love that too. Loved this post! Such amazing images and enjoyed the interview too! I absolutely adore that very first picture! Amazing! love her work! Your blog is so inspiring! Great interview! I love the little details like fave foods and places, music and indulgences.. it makes everyone so human!